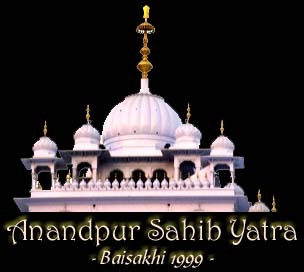 "As we walk on this sacred land of Anandpur Sahib we touch the spirit and soul of those who were there 300 years ago. 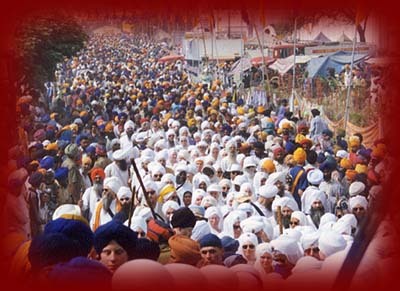 They were called by Guru Gobind Singh just as you now are called by the longing and love you have for the Panth Khalsa. This yatra is in celebration of the rebirth of our spirit so that our children will continue to carry this banner of Khalsa to all four corners of this world. This event could have the global impact to educate all people around the world on the values and love of Khalsa." Viewing TIP: All the photographs have captions describing what is happening within the picture. In order to view the caption hold your cursor over a photograph and a description will pop-up next to the cursor. (Only some newer web browsers support this feature like Netscape & Internet Explorer). Navigation: You can navigate through the whole web site either by clicking on the "Back - Next" links at the top of every page or you can follow the links at the bottom of the page which are in order. There are also some links to pages that are not listed on the home page (eg. Baisakhi resources, Table of contents, Web site Credits). = Link to another web site giving additional information. = Photograph that you can look at.